The normal way to set about making a map is to obtain some data that represents the shapes and features of the place you’re mapping and then to generalize, classify and symbolize it to suit your map. You then might overlay some thematic detail…again with heavy doses of processing to capture the essence of your message. You may add some textual components and all sorts of marginalia. WHat happens when you throw all of that out the window and approach the making of your map a different way. 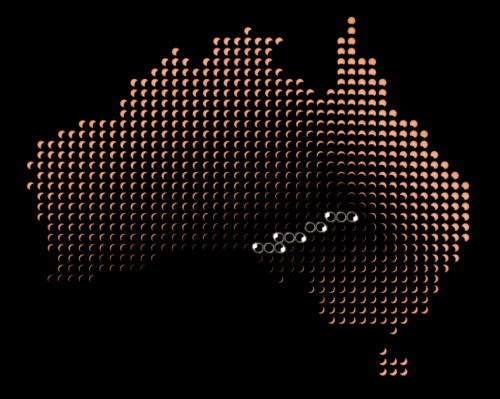 That’s exactly what Fre Breunjes did in this map of the 2002 Australian Total Solar Eclipse. There’s no topographic detail, no thematic detail and no typography. There isn’t even a title! All of this accentuates the map rather than detract from it. Breunjes collected images of the solar eclipse at its maximum taken from various parts of Australia and mosaiced them into a grid of small multiples. A total solar eclipse will be observed as the Moon’s orbit passes between Earth and the Sun and if you are located somewhere near the middle of the shadow. Consequently, as the orbits move, a total solar eclipse will occur along a linear path. Either side of this path you’ll see a partial solar eclipse with less shadow the further away you are. This beautiful map, then, doesn’t even map anything terrestrial, it maps an astronomical view from that location. The small multiples convey the amount of eclipse seen at each location and the grid of small multiples creates a quite spectacular pattern. Concentrating on the area near total eclipse you can see a variety of patterns that occur during the different phases of contact including the so-called Baily’s Beads and diamond ring effects. You’d probably not teach a student of cartography to remove every conceivable element of a map in order to make a map yet this example proves that it’s possible. There’s absolutely no need for any other component (except perhaps a title but that’s part of the context in which Breunjes describes the map so it’s not totally absent). You can see more detail of the maps and a version of the same approach for Africa at Breunjes web site here. This entry was posted in MapCarte and tagged abstract, imagery, MapCarte, photographic, thematic by @kennethfield. Bookmark the permalink.